Lions star Daly has pledged his future to the Coventry club, despite interest from a host of Premiership rivals. British and Irish Lions star Elliot Daly has signed a new contract with Wasps. England’s 24-year-old utility back has pledged his future to the Coventry club, despite interest from a host of Premiership rivals. Saracens and Harlequins were understood to have been keen to recruit Daly, who started all three Tests for the Lions in the summer’s drawn series in New Zealand. Wasps boss Dai Young hailed Daly’s new deal as another feather in the cap for last term’s beaten Aviva Premiership finalists. “Elliot is an integral member of our squad and it is fantastic for the club that he has signed a contract extension with us,” said Young. “Despite his relatively young years, he already has a wealth of experience. He has consistently been one of our stand-out players over recent seasons and has seized every opportunity that has come his way on the back of those performances. “As a director of rugby, I was also pleased that Elliot committed to the club with a season still to run on his current contract. “We’re not daft, we know a player of his class would have topped a number of clubs’ lists when January came round, but Elliot believes in the potential of our squad and is happy that this is a place where he will continue to produce his best rugby. “I was really pleased for him that he was able to show everyone exactly what he’s capable of at the very highest level during the Lions tour. Elliot is one of the key leaders in the group and the exciting thing is there is still so much to come from him. Daly has won 13 caps with England, forcing his way into Eddie Jones’ Test side on the wing, a role that he reprised with the Lions. He remains just as happy at outside centre with Wasps however, and can also operate at full-back. The Wasps academy graduate has racked up 157 club appearances since his 2010 debut aged just 18. 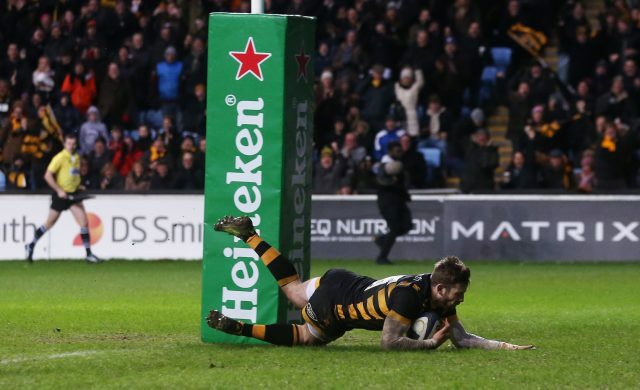 Daly has helped Wasps progress from a relegation-threatened club without a home to one of the most potent sides in Europe, since their switch to Coventry’s Ricoh Arena. “I’m really pleased to have extended my contract with Wasps,” said Daly. “In some ways it seems like yesterday that I made my Wasps debut. In other ways, when you think of the progress we’ve made as a club and squad over the past five years in climbing from 11th to first at the end of the regular season, it feels like a lifetime ago. The great thing about this squad is that many of us have grown up together. “We’ve been through some tough times and have started to enjoy some much better times. Dai trusted us to go out and show what we could do back then and we’re seeing the benefits of that backing now. The core of the squad has remained the same, while Dai’s also added some extra experience and proven internationals to supplement the English talent we’ve developed here.